Pro milovníky loveckých motivů jsme připravili nabídku loveckého porcelánu. Pokud mezi vaše záliby patří myslivost nebo rybářství budete jistě spokojeni. 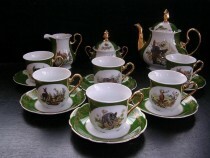 Leander Loučky COFFEE SET MARY ANNE 363 15pcs. Leander Loučky Set of plates Mary Anne 763 hunting, green cobalt. 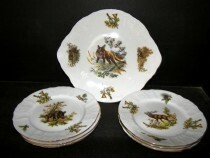 Concordia Bernadotte Dining set 1011 hunting 25pcs. 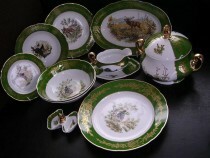 Moritz Zdekauer A set of plates 788 Ophelia hunting motifs 18pcs. 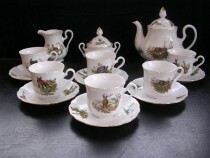 Moritz Zdekauer Tea set Ophelia 788 15d hunting motifs. 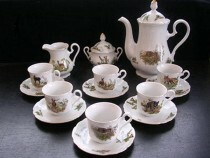 Moritz Zdekauer Coffee set Ophelia 788 15pcs hunting motifs. 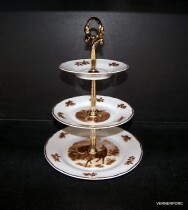 Concordia Cup with saucer 0.15 L. Bernadotte Hunting 6 pieces. 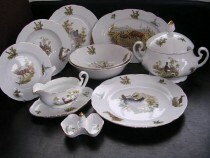 Concordia Coffee set Bernadotte hunting 15pcs. 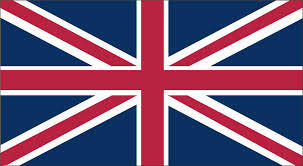 Concordia Bernadotte Cup and Saucer Tea 0.2 l hunter 6 pieces. 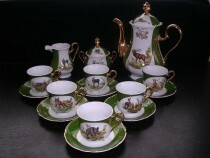 Concordia Tea set Bernadotte hunting 15pcs. Leander Loučky Mary Anne compote set 7 piece 363. Leander Loučky Mary Anne Cake Kit 363 Pieces 7. Moritz Zdekauer 788 Ophelia compote set 7 piece. Moritz Zdekauer 3 storey whatnot Ophelia 788. Becom Korbel hunting with cover 0.5 l., DEER decor. Leander Loučky Přátelská souprava Mary Anne 763 7 dílná. Moritz Zdekauer Friendly kit Vienna 788 7 Piece. Leander Loučky Cake Kit Mary Anne 763 7 pcs. Leander Loučky Compote kit Mary Anne 763 7 pcs.